The integrity of neural wiring is a big factor in determining intelligence. It's also inheritable. Pixilated brain: At the bottom, an MRI image shows a slice of the human brain. At the top is shown a magnified portion of this section, created using diffusion imaging. To create the image, scientists measured the direction of the water diffusion in brain tissue. The "flower petals" at each point show the directions of fastest diffusion. These are aligned along the neural pathways of the brain, because water diffuses directionally along the well-insulated neural wires that carry electrical signals. The different directions of diffusion are color-coded red, green, and blue. In this example, the bright red areas reveal the thick fiber tract, called the corpus callosum, which transfers information between the left and right sides of the brain. 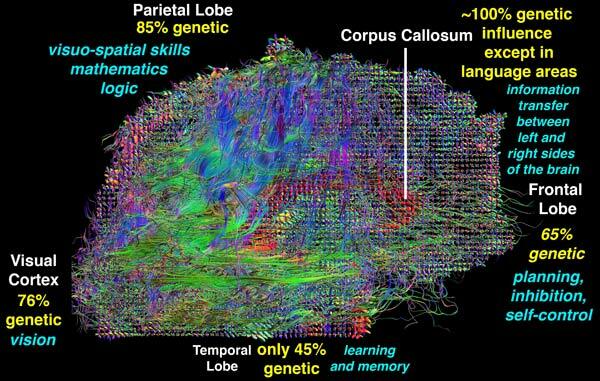 Watch an animation of the human brain network. New research suggests that the layer of insulation coating neural wiring in the brain plays a critical role in determining intelligence. In addition, the quality of this insulation appears to be largely genetically determined, providing further support for the idea that IQ is partly inherited. The findings, which result from a detailed study of twins' brains, hint at how ever-improving brain-imaging technology could shed light on some of our most basic characteristics. "The study answers some very fundamental questions about how the brain expresses intelligence," says Philip Shaw, a child psychiatrist at the National Institute of Mental Health, in Bethesda, MD, who was not involved in the research. The neural wires that transmit electrical messages from cell to cell in the brain are coated with a fatty layer called myelin. Much like the insulation on an electrical wire, myelin stops current from leaking out of the wire and boosts the speed with which messages travel through the brain--the higher quality the myelin, the faster the messages travel. These myelin-coated tracts make up the brain's white matter, while the bodies of neural cells are called grey matter. White matter is invisible on most brain scans, but a recently developed variation of magnetic resonance imaging, called diffusion-tensor imaging (DTI), allows scientists to map the complex neural wiring in our brains by measuring the diffusion of water molecules through tissue. Thanks to the fatty myelin coating, water diffuses along the length of neural wires, while in other types of brain tissue it moves in all different directions. Researchers can calculate the direction of fastest diffusion at each point in the brain and then construct a picture of the brain's fiber tracts. A well-organized brain has well-functioning myelin, in which water can be seen clearly moving along specific paths. "Diffusion imaging gives a picture of how intact your brain connections are," says Paul Thompson, a neuroscientist at the University of California, Los Angeles, who lead the study. Thompson and his colleagues took DTI scans of 92 pairs of fraternal and identical twins. They found a strong correlation between the integrity of the white matter and performance on a standard IQ test. "Going forward, we are certainly going to think of white matter structure as an important contributor of intelligence," says Van Wedeen, a neuroscientist at Massachusetts General Hospital in Boston, who was also not involved in the research. "It also changes how you think about what IQ is measuring," says Wedeen. The research was published last month in the Journal of Neuroscience. IQ inheritance: By comparing the brain scans of twins, scientists discovered that the quality of the fatty tissue that insulates neural wires is largely inherited. The parietal lobe, which is involved in logic and mathematics, is 85 percent genetically determined, whereas the visual cortex is about 76 percent, and the temporal lobe, which is involved in learning and memory, is only 45 percent genetically determined. If white matter is linked to both processing speed and IQ, this raises the question: is intelligence merely a function of how fast your brain works? Previous research has linked processing speed to IQ, but the tests used in the study are measures of general intelligence, including verbal skills, math, and logic. "Processing speed plays a big part in how intelligent you are, but it's not the only factor," says Shaw. The new study is among the first to link a specific neural architecture to IQ in healthy individuals. "Most people have focused on grey matter," says Shaw. "This is good evidence we should be looking at white matter as well." Previous studies using DTI have linked white matter damage to Alzheimer's disease, chronic alcoholism, and traumatic brain injury. The UCLA researchers took the study a step further by comparing the white matter architecture of identical twins, who share almost all their DNA, and fraternal twins, who share only half. Results showed that the quality of the white matter is highly genetically determined, although the influence of genetics varies by brain area. According to the findings, about 85 percent of the variation in white matter in the parietal lobe, which is involved in mathematics, logic, and visual-spatial skills, can be attributed to genetics. But only about 45 percent of the variation in the temporal lobe, which plays a central role in learning and memory, appears to be inherited. Thompson and his collaborators also analyzed the twins' DNA, and they are now looking for specific genetic variations that are linked to the quality of the brain's white matter. The researchers have already found a candidate--the gene for a protein called BDNF, which promotes cell growth. "People with one variation have more intact fibers," says Thompson. The search for the genetic and neuroanatomical basis of intelligence has been controversial, largely because opponents fear it will spawn a deterministic view of abilities and education. "People worry that if something is genetic, they have no power to influence it," says Thompson. "But that's not true at all." For example, both an average runner and a genetically gifted one can benefit from training. But the debate may be moot since, as Wedeen points out, it is unlikely that an individual brain scan could predict a person's IQ. "The report described aggregate data over number of individuals," he says. "That's not the same as saying we can do a scan and determine a person's intelligence. That may be in the offing, but we don't know that yet." The National Phenology Network’s Project Budburst Facebook group; an unidentified insect posted by Flickr user urtica as part of a citizen science project Life on the Japanese Knotweed; pasque flowers spotted in Brainerd, MN, by Flickr user esagor. Are you plugged in to the Internet? Are you an amateur hiker? Photographer? Gardener? Birdwatcher? Frog aficionado? Nature lover? If the answer to any of these questions is “yes,” then with the click of a button you can also make a serious contribution to the study of climate change. Online social networking is no longer just about tagging a picture of your dog on Facebook or announcing to the world what you’re having for dinner on Twitter. Scientific institutions worldwide are beginning to harness the power of online social networking for scientific research. Online communities are an ideal vehicle for matching professional scientists with armies of enthusiastic amateurs. This corps of citizen scientists has the capacity to capture far more data over a vastly expanded geographical spectrum than professional scientists can on their own. The USA National Phenology Network is one organization that is reaching out to citizen scientists via the Internet. People have used phenology, the study of the timing of lifecycle events of plants and animals, to detect the signs of spring since the early 18th century. The rising threat posed by global warming has spurred scientists to put phenology to another use: to detect the signs of climate change. Plants and animals are very sensitive to even the smallest changes in their climates. Shifts in the timing of their lifecycle events can therefore be an important indicator in the study of climate change and its effects. Slight changes can have huge repercussions; mutual relationships between species and even entire systems can begin to fall apart. USA-NPN is asking people across the country to record the phenology of their local flora and then report it online. Amateur hikers and photographers can also participate in NPN’s Project Budburst. They are asked to identify the phenological stage of the flowers and plants they see using information provided by the project’s website. The participants record the location, longitude, and latitude of what they observe. Eventually, Project Budburst will use this information to include real-time mapping with Google maps. Relying on anonymous volunteers to collect data that will be entered into important scientific databases certainly raises questions about the reliability of the information gathered. Yet it turns out that most of the data is remarkably accurate, and researchers do perform checks on anomalous data. What’s more, the large pool of samples collected by a large group of volunteers diminishes the impact of any faulty data. This creative new use for social networking also answers critics’ accusations about the frivolity of Facebook, Twitter, and other sites with proof that online networking has the potential to mobilize users to actively participate in innovative programs. Jack Weltzin, executive director of NPN, has said that in the future NPN hopes to make it possible for people to submit their findings via Twitter. NPN, a nonprofit organization, also hopes that iPhone and Facebook applications might be created to more easily facilitate volunteer participation. 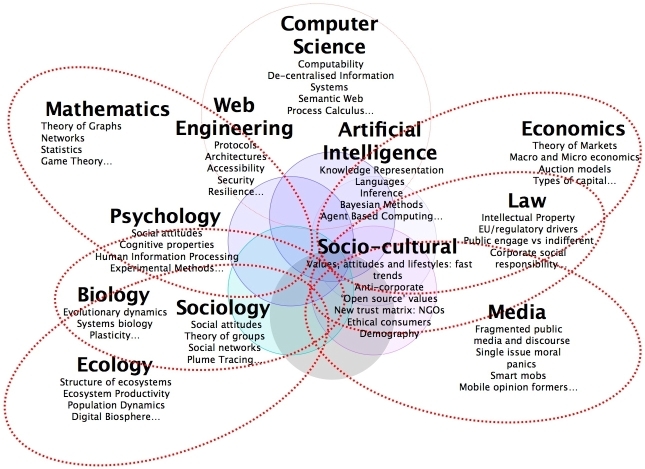 Climate change scientists are not the only members of the scientific profession to tap into the potential of these online communities. In addition to tracking climate change, the information participants collect can help scientists predict wildfires and pollen production and monitor droughts as well as detect and control invasive species. Other online projects, such as “The Great World Wide Star Count,” rely on volunteer participation to gauge the level of light pollution across the globe. Several websites are also dedicated to tracking the migratory and breeding patterns of animals such as birds, frogs, and butterflies. All of these observations will augment the databases available to scientists attempting to understand annual fluctuations. Imagine what the near future will bring–a world where you wake up, look out your window, and notice the first lilac blossom of spring. As you drink your coffee, you report your floral spotting on Twitter. Presto! You’ve made a contribution to the study of climate change before you’ve even had your eggs. So the next time you head outside, grab your camera and snap a picture of the flowers that are starting to bloom in your neighbor’s yard. Then plot your location on your Google maps and give scientists the help they need to understand global warming and its consequences. This piece originally appeared on Climate Progress. This article is reprinted from the Center for American Progress’s “It’s Easy Being Green” series. Une utilisation intéressante du "crowdsourcing" et des réseaux sociaux. A phone application highlights hot spots and will soon show where different urban "tribes" gather. Outside vibe: Citysense is a downloadable application for the iPhone and BlackBerry. 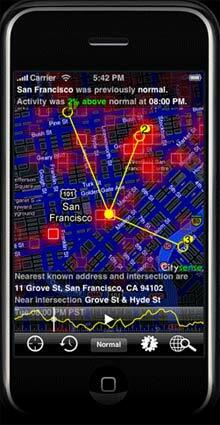 It provides a heat map of GPS activity in a major city. Here, San Francisco is shown with red patches that indicate higher activity. The application has also identified the user’s location (a solid yellow dot) and suggests popular destinations (yellow circles). Animations showing how the technology works. Over the course of any day, people congregate around different parts of a city. In the morning hours, workers commute downtown, while at lunchtime and in the evening, people disperse to eateries and bars. While this sort of behavior is common knowledge, it hasn't been visible to the average person. Sense Networks, a startup based in New York, is now trying to bring this side of a city to life. Using cell-phone and taxi GPS data, the startup's software produces a heat map that shows activity at hot spots across a city. Currently, the service, called Citysense, only works in San Francisco, but it will launch in New York in the next few months. On Wednesday, at the O'Reilly Emerging Technologies conference in San Jose, CA, Tony Jebara, chief scientist for Sense Networks and a professor at Columbia University, detailed plans of a forthcoming update to Citysense that shows not only where people are gathering in real time, but where people with similar behavioral patterns--students, tourists, or businesspeople, for instance--are congregating. A user downloads Citysense to her phone to view the map and can choose whether or not to allow the application to track her own location. The idea, says Jebara, is that a person could travel to a new city, launch Citysense on her phone, and instantly get a feel for which neighborhoods she might want to spend the evening visiting. This information could also help her filter restaurant or bar suggestions from online recommendation services like Yelp. Equally important, from the company's business perspective, advertisers would have a better idea of where and when to advertise to certain groups of people. Citysense, which has access to four million GPS sensors, currently offers simple statistics about a city, says Jebara. It shows, for instance, whether the overall activity in the city is above or below normal (Sense Networks' GPS data indicates that activity in San Francisco is down 34 percent since October) or whether a particular part of town has more or less activity than usual. But the next version of the software, due out in a couple of months, will help users dig more deeply into this data. It will reveal the movement of people with certain behavior patterns. "It's like Facebook, but without the self-reporting," Jebara says, meaning that a user doesn't need to actively update her profile. "We want an honest social network where you're connected to someone because you colocate." In other words, if you live in San Francisco and go to Starbucks at 4 P.M. a couple of times a week, you probably have some similarities with someone in New York who also visits Starbucks at around the same time. Knowing where a person in New York goes to dinner on a Friday night could help a visitor to the city make a better restaurant choice, Jebara says. As smart phones with GPS sensors become more popular, companies and researchers have clamored to make sense of all the data that this can reveal. Sense Networks is a part of a research trend known as reality mining, pioneered by Alex Pentland of MIT, who is a cofounder of Sense Networks. Another example of reality mining is a research project at Intel that uses cell phones to determine whether a person is the hub of a social network or at the periphery, based on her tone of voice and the amount of time she talks. Jebara is aware that the idea of tracking people's movements makes some people uncomfortable, but he insists that the data used is stripped of all identifying information. In addition, anyone who uses Citysense must first agree to let the system log her position. A user can also, at any time, delete her data from the Sense Networks database, Jebara says. Part of Sense Networks' business plan involves providing GPS data about city activity to advertisers, Jebara says. But again, this does not mean revealing an individual's whereabouts--just where certain types of people congregate and when. For instance, Sense Networks' data-analysis algorithms may show that a particular demographic heads to bars downtown between 6 and 9 P.M. on weekdays. Advertisers could then tailor ads on a billboard screen to that specific crowd. So far, Jebara says, Sense Networks has categorized 20 types, or "tribes," of people in cities, including "young and edgy," "business traveler," "weekend mole," and "homebody." These tribes are determined using three types of data: a person's "flow," or movements around a city; publicly available data concerning the company addresses in a city; and demographic data collected by the U.S. Census Bureau. If a person spends the evening in a certain neighborhood, it's more likely that she lives in that neighborhood and shares some of its demographic traits. By analyzing these types of data, engineers at Sense Networks can determine the probability that a user will visit a certain type of location, like a coffee shop, at any time. Within a couple of weeks, says Jebara, the matrix provides a reliable probability of the type of place--not the exact place or location--that a person will be at any given hour in a week. The probability is constantly updated, but in general, says Jebara, most people's behavior does not vary dramatically from day to day. Sense Networks is exploring what GPS data can reveal about behavior, says Eric Paulos, a professor of computer science at Carnegie Mellon. "It's interesting to see things like this, [something] that was just research a few years ago, coming to the market," he adds. Paulos says it will be important to make sure that people are aware of what data is being used and how, but he predicts that more and more companies are going to find ways to make use of the digital bread crumbs we leave behind. "It's going to happen," he says. Measuring our individual carbon footprint helps us see where our choices fit into the bigger picture. And, because various tools allow us to calculate our impacts at the individual level with relative accuracy, it's easy to discuss what they are and how to change them. But as we've noted before, hyper-focusing on individual responsibility in the face of climate change can be confusing … or worse. Rob Bernard, Chief Environmental Strategist for Microsoft and one of the panelists at the discussion, believes this squabble represents a widespread problem in the dialogue about best sustainability practices. In an effort to make these data sets both accessible and standardized at a scale beyond the individual, Microsoft is developing software to quantify extraordinarily large and complex environmental footprints. Partnering with the Clinton Foundation, the International Council for Local Environmental Initiatives, Ascentium Corporation and the Center for Neighborhood Technology in an initiative called Project 2˚, Microsoft is developing software to track GHG emissions generated by major cities. The free web-based application will be available to the C40—a summit of the world’s 40 largest cities—as a means of sharing information online and tracking the efficacy of current programs. The idea is to standardize the language describing metropolis-scale environmental impact and facilitate discussion about best practices. The application is similar to another release from Microsoft called the Environmental Sustainability Dashboard, which allows businesses to track resource consumption and emissions by plugging in figures from past utility bills. Applied at the city scale, the software could be a valuable tool in assessing and deconstructing the impact of massive, complex systems, and could provide insight in drafting future climate initiatives. 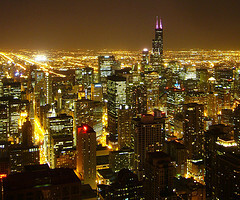 Sharon Hoyer is a freelance writer covering sustainability, culture and arts in Chicago. You can find more of her writings on the environment at Centerstage Chicago. You can find her in the garden or on her bike.